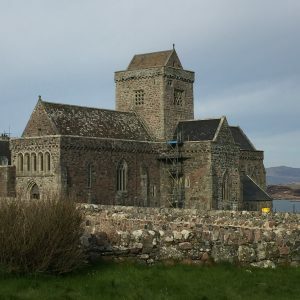 Iona, a tiny Holy Isle off the West coast of Scotland, is a still point in our turbulent world. It is a place of fine attunement and profound peace. Of all the sacred sites I have had the privilege of visiting, it is the most simple and sublime. Each day we will dance in the ruins of the pink granite medieval nunnery, Our long time ancestors will no doubt meet us here, just a few steps from the Argyl Hotel where we will stay and take our meals. 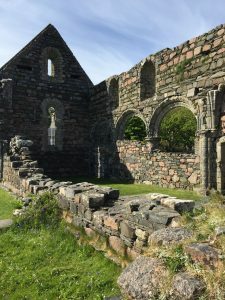 The nunnery is a quiet spot in the center of the island village of Baile Mor where we can meditate and read and write during our moments of solitude. Each day, after our morning practice, breakfast and sacred circle, we will hike the island to its four directions. 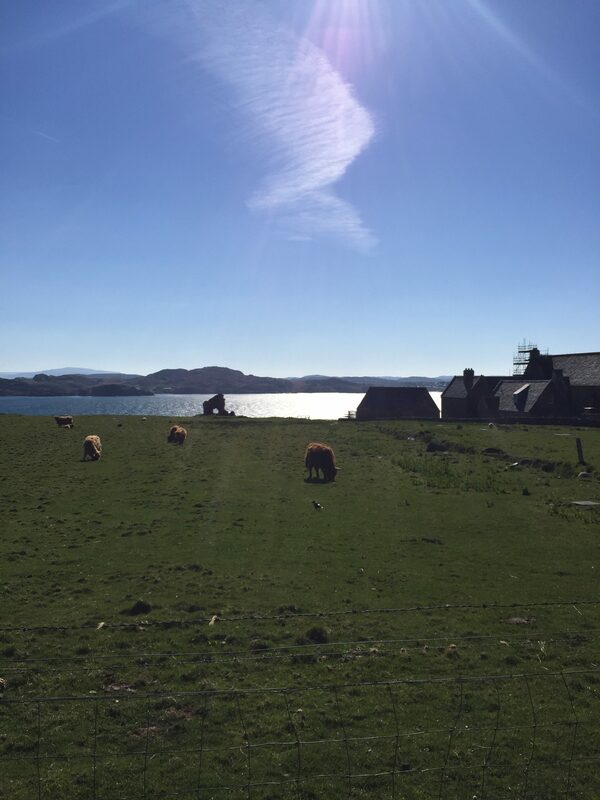 In the East, we will look toward the mystical island of Mull with its misty mountains and contemplate the vision that has brought us to pilgrimage. 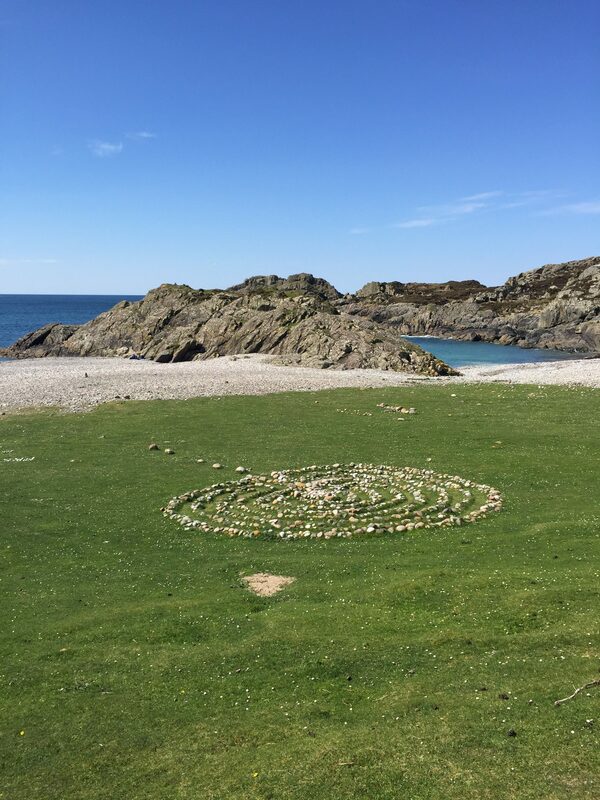 In the South, we will meet the beautiful Labyrinth at at St. Columba’s Bay, contemplating the trust and faith that brought the saint to these shores. Our guide will teach us the local history and mythology and show us the path through pastures and rocky outcroppings. 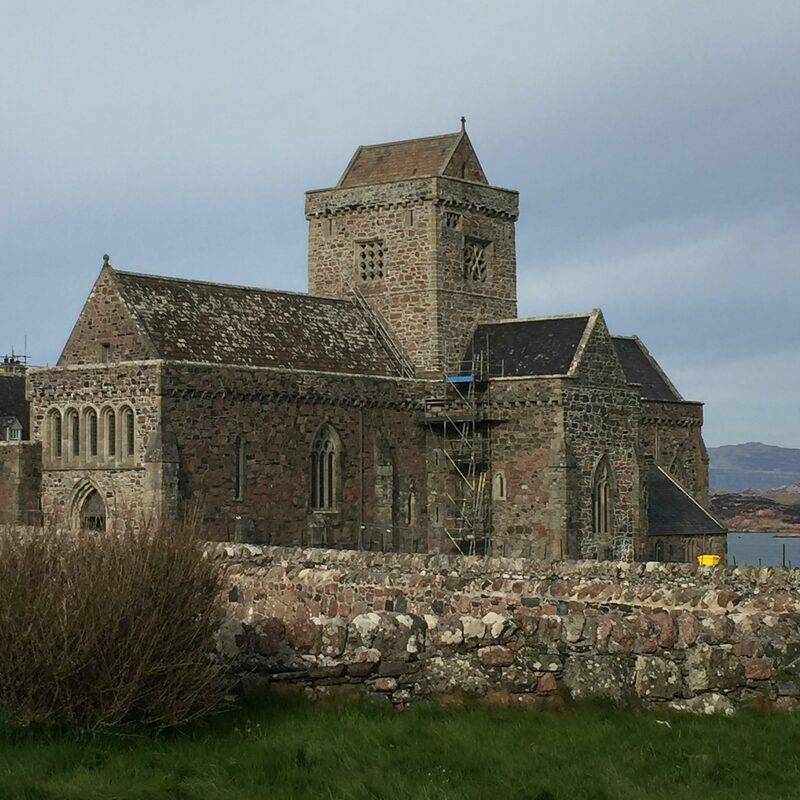 Toward the North, we will visit the Abbey restored in modern times and learn of the vibrant Iona Community . 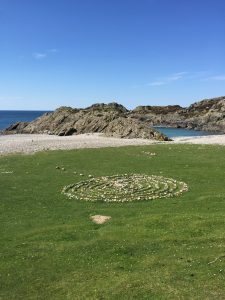 Further on, we meet the white sand beach of the northern shore and create our own labyrinths and gather our own unique wisdom. 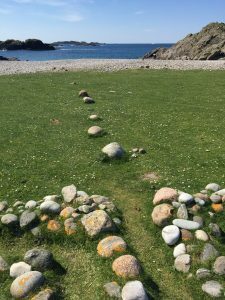 In the West, we will visit the Machair overlooking the vast Atlantic, contemplating the deep waters of our psyches and sending our dreams out to sea to meet us in our everyday lives. We will begin our pilgrimage in Glasgow, meeting at the Grand Central Hotel in the center of town on September 16 . We will have our first circle in the Victorian splendor of the hotel and then travel together from the nearby train station on the morning of the 17th. 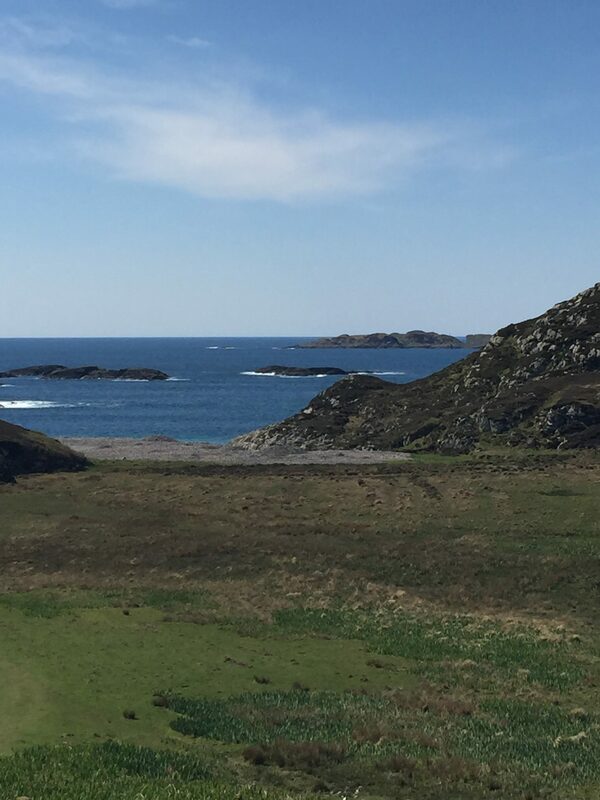 Our 4 hour train ride reminiscent, of the Hogwarts express, takes us through glorious scenery to Oban where the ferry to the Isle of Mull awaits. After a 45 minute cruise, we are met by a bus that takes us on a one way track around the island, where another ferry takes us to Iona– a mere 15 minute ride. The Argyl Hotel http://www.argyllhoteliona.co.uk/ is a very short walk away. 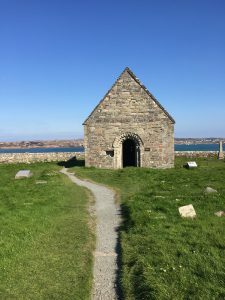 We will arrive by the late afternoon in time for our first circle and Vespers. It is your responsibility to get to Glasgow, purchase a room at the Grand Hotel or nearby accomodation, purchase your train/ferry tickets through Scotrail https://www.scotrail.co.uk/tickets, and book your B&B at the Argyl. Our rooms are reserved and each of us will be responsible for the room we book and our lunches and dinners. Cost for the pilgrimage apart from transportation and accommodation is $700. Please contact: Judith@CircleWay.com ~ 415.552.4546, with questions. To register, download, complete and mail our registration form HERE!